Hi All~The results of our Writing Prompts Contests #43 & #44 are out! This week’s writing prompts will have two main topics. Typically, the main character in an apocalypse novel starts off as an ordinary person. However, the main character will then receive all sorts of lucky chances when the apocalypse arrive, such as receiving an evolution system, or miraculously obtaining some core from a mutated beast which can help him or her to evolve. At any rate, the main character will then obtain supernatural powers which will help them to survive in the apocalypse and create their own faction. Apocalypse novels are also often reincarnation novels. In such novels, the main character has already died once in the apocalypse, and then reincarnates to right before the apocalypse's arrival. At such a time, the main character will then use their knowledge of the future to prepare for the upcoming apocalypse earlier than everyone else, thus gaining an advantage. "Believe it or not, the only way we kept in touch was through letters. We would write to each other about our days, about our lives. They were all innocent letters, but they were amazing because it gave me an insight into how simple a person he was." What it feels like loving a soldier? "When you fall in love with a soldier, you fall in love with your country; when you fall in love with a soldier, nothing is set in stone on your end. Plans can and will change at the drop of a hat and planning ahead is impossible. Though all that is true, so is when you fall in love with a soldier, you've found the best there is. When you fall in love with a soldier, you've found someone who not only loves you more than his own life but loves his country more than his own life as well. When you fall in love with a soldier, a kiss is worth a million dollars, and no expensive gift can compare. When you fall in love with a soldier, you've fallen in love with someone who appreciates having a bed, running water and warm food. When you fall in love with a soldier, you've fallen in love with not who you've prayed for, but someone so much more. Thank you, God, for letting me fall in love with my soldier." When you create your new novel, you can choose any genre that you wish. Then, the writing contest options will appear. 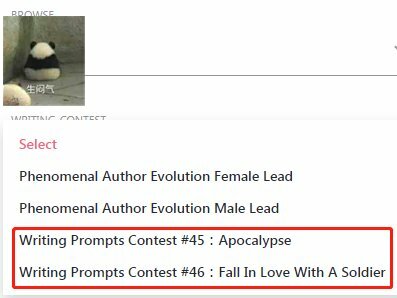 Choose the [Writing Prompts Contest #45：Apocalypse] or [Writing Prompts Contest #46：Fall in Love with a Soldier] option in order to participate in this contest. 1.The main topic of your novel should be Apocalypse or Fall in Love with a Soldier. Otherwise, it shall be treated as an invalid entry. 3.The contest will take place from January 7, 2018 to January 13, 2018 (GMT +8). WEBNOVEL_OFFICIAL there were many more, why weren't they chosen? Just curious since I’m new here lol for prompt #46 is that a story plot that ppl is gonna recreate using it or just an example of what u meant by falling in love w a soldier? I’m rlly interested!!! BwellyJel example! of course. Create your own, interesting story! Oooh!!!! Both are really interesting topics!!!! Ive started a No imperial units discussion If / when webnovel sees this could you pls read it and comment... Thank You. Crixzivion I just want to say that if anyone has seen Bird Box this sounds like it could be a sequel with a more fantasy take on it. But, just the blind people and instant dead monster thing. Yuyumamoru exactly! I just recently watch bird box so I thought I should make it as a preference.... And some final touch here and there..
Well, I'm just here to advertise my novel under the Apocalypse setting. All the best to the new entries, these two topics are really fun to write. Do I have to submit a prompt? or do I have to start writing a novel and release it throughout the week? It will not be easy to submit a whole idea in just 7-8 chapters. please answer. Spunk_image Follow your pace. Quality is important! lol! Um, forgive my newbieness, but what does "reserves the right of final interpretation for all stories submitted..." mean? Is this to do with language translation? Also, are we picking from the sample or just writing to the theme? Does this mean the story is won through votes? Or will there be a judges choice as well? Can any one tell me the advantages of these contests other than the advertisements??? AveAnderson most oblivious one is the spirit stones. a tiny to no chance of getting a contract. Hi im new here, so we'll have to use these two topics? And there is no word count limit? Here's my little participation for the Apocalypse theme.